Being married to a foodie is a gourmet experience for your taste buds. They love to experiment in the kitchen and there is nothing better for them than finding a new indulgent ingredient or the latest must have kitchen gadgetry. 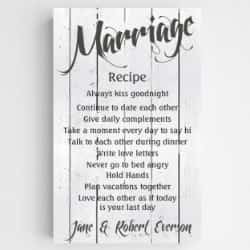 So when it comes to finding the perfect wine and food themed anniversary gift for them you know it will need to be tempting and tasty. Or creating a beautiful herb garden for your kitchen window sill or backyard. Other more lasting homemade gifts are oil infusions and flavored salts. Oil Infusions are really easy to make yourself and all you will need is; Olive Oil, something to give the flavour like herbs, chilli, or garlic and small bottles. I love the Kilner bottles with the flip top lids and the jars work equally well, they are just a bit more tricky to pour the oil out. If you are going to make chilli oil you will need to place the whole chilli in the bottle and then top up the bottle with the oil and leave it to get on with creating a gorgeous oil with a bit of a kick. Tie a label to the bottle before you gift it and you have a very cute foodie gift. 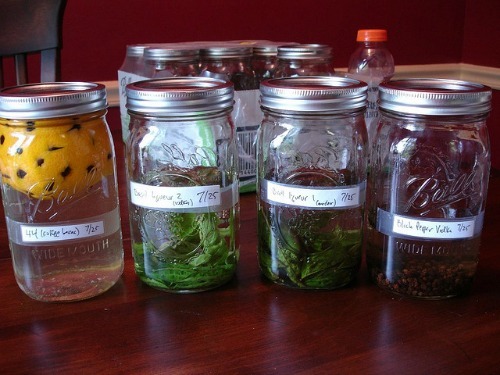 You can also make infusions with vodka, rum or gin too. Flavored salts are just as easy, you will need to add the flavors and the salt into a kilner style jar and then leave it. When you live with a foodie you will know that they love all the latest kitchen gadgetry. It always amazes me the vast array of gadgets you can buy. My favorite has to be a cherry stoner! But seriously check out the most wished for items on Amazon , hopefully you will be as amazed as we were. 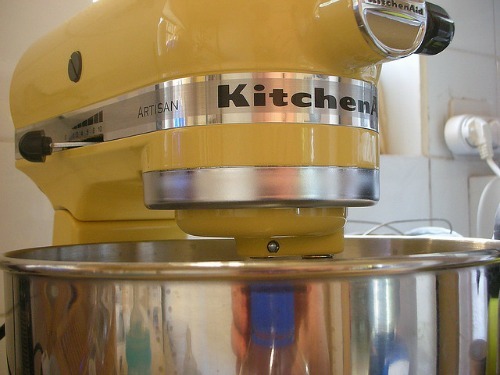 Kitchenaid mixer – such an iconic looking mixer and it comes in so many pretty colors too. Thermomix – everyone we know who has one of these raves about it, although it is expensive. And you can never go wrong with top quality knives or maybe even a whetstone to sharpen the ones they already have. If they love to bake then there are lots of gadgets to choose from; silicon bakesheets, mixers, decorating gadgets, baking trays and moulds. When it comes to buying ingredients for an anniversary gift you want it to be special. This could be a hard to find ingredient that they may have read about in a food magazine or seen on a cookery program. 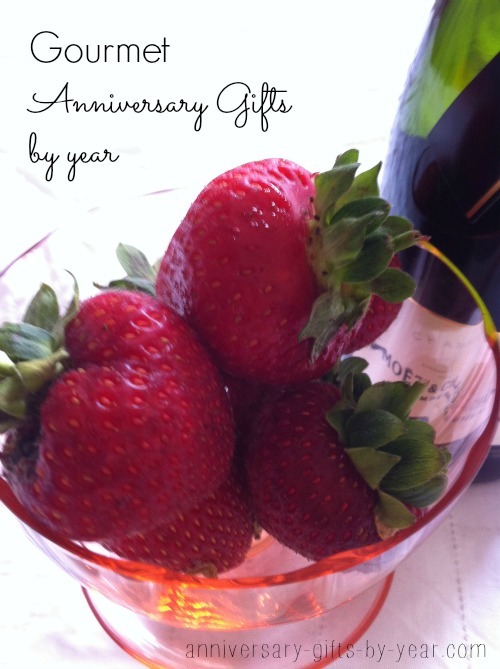 There are monthly gift services that would send a new ingredient every month for them to try, that way your gift will last all the way to your next anniversary. 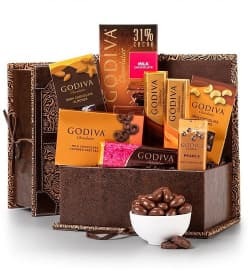 You could make up your own hamper filled with lots of gourmet treats and if you theme your hamper you may find it easier. 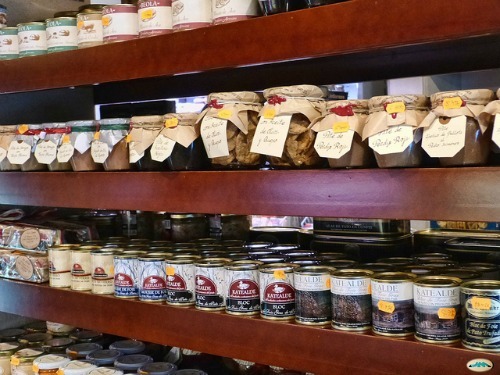 You could have a hamper with everything to make a particular recipe, or everything from a particular region. 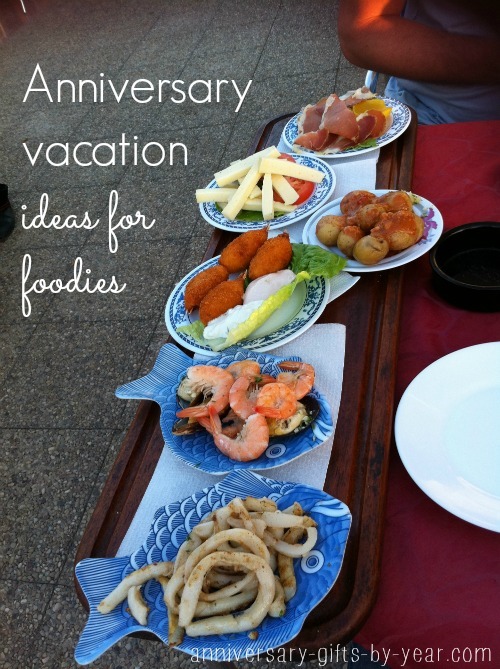 You couldn’t get better than enjoying all of these foodie treats whilst on vacation or away for a weekend. There are lots of cookery weekends or even day courses that you could enjoy together, learning new culinary skills and eating tasty food would make a fab weekend. Combine their love of food with your love of vacations and you would have a very special time. Lonely Planet put together their top 10 places for foodie lovers. You may have your own favorite foods that you would love to try in their country of origin. We have been lucky enough to enjoy gorgeous Greek food in tiny tavernas, fiery hot Thai curries in Bangkok, Irish stews and col-cannon in Dublin pubs and lots of others too. Just love the idea that you can immerse yourself in the culture and traditions at the same time as enjoying your favorite foods. Of course you don’t have to travel round the world to get to sample these treats, there are fine restaurants in big cities and hidden gems in villages and towns near you. 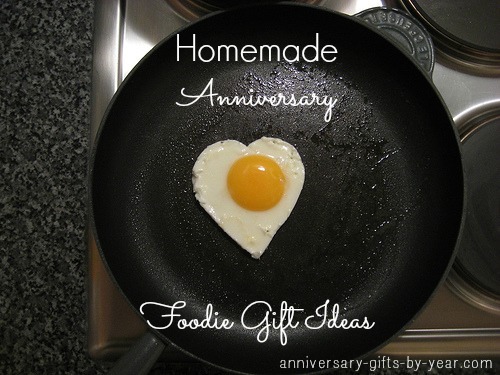 We wouldn’t be doing our job properly if we didn’t also find you a great foodie gift that fitted with the anniversary symbol for each year. 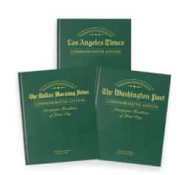 1st anniversary is paper – we are thinking a new cookery book to add to their expanding collection or you can also get a monthly subscription to their favorite food magazine. My personal favorite is the Good Food magazine, which I have been receiving for the past 4 years and no I haven’t thrown any away. 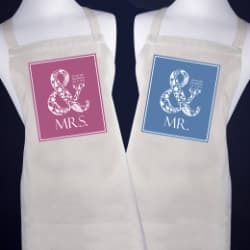 2nd anniversary is cotton and there are lots of fun and also serious aprons or cooking themed t-shirts. 3rd anniversary is leather which would be perfect for a leather bound cookery journal or leather knife wallet to store away all of their favorite knives. 4th anniversary is linen which makes great table linen and also linen napkins, both fantastic if your foodie loves to entertain and create scrumptious dinner parties. 5th anniversary symbol is traditionally wood and one of the most wished for kitchen gifts of a bamboo chopping board. 6th anniversary is traditionally iron and wow there are loads of fantastic options here; iron skillets, waffle irons, iron Dutch oven, tortilla press, and a grill press. 8th anniversary is traditionally bronze which could mean very stylish bronze Anodized pans or you could look to the modern list for your gift which is linen, just like your traditional gift for your 4th. 9th anniversary symbol is traditionally pottery and you could look at stylish pots, plates and storage jars. Or a window ledge herb garden would also be perfect for the theme. 10th anniversary is tin and if your foodie loves to bake then there are lots of great baking tin gifts to store their favorite cookies or cakes, you can even personalize them too. Also love the idea of gifting a tin of their favorite guilty food pleasure – is it a tin of beans or spaghetti hoops? Or you could hunt out a really unique tinned gourmet treat. 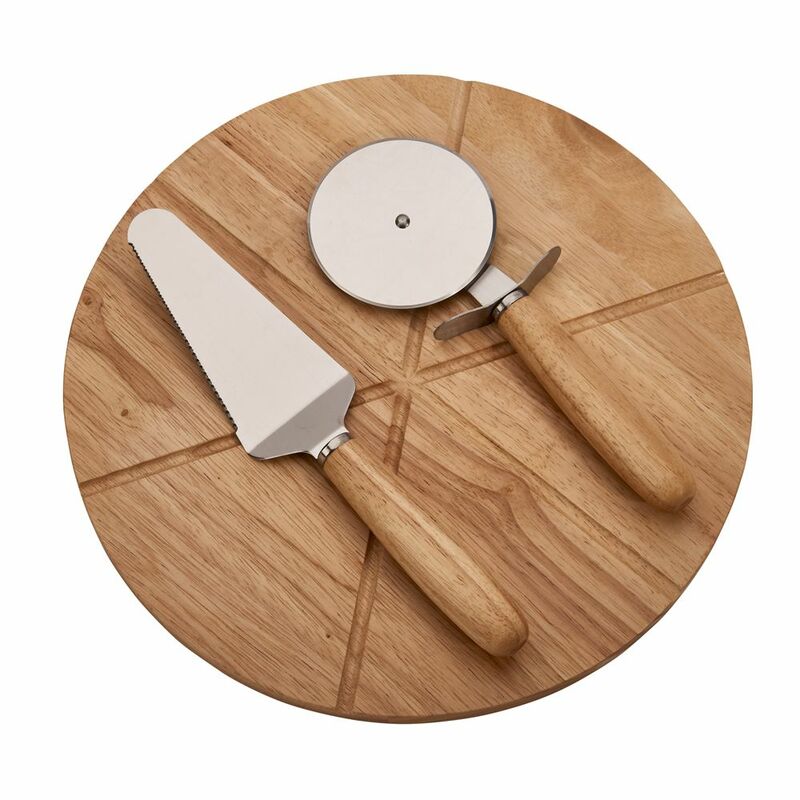 11th anniversary gift is traditionally steel and this is a truly special foodie gift as they are bound to love the latest knife set, there are some truly special ones to choose from. 12th anniversary gift is traditionally silk which doesn’t easily lend itself to a foodie gift but it makes great table runners. You could even look at a hand painted silk painting, framed for your dining room. 13th anniversary gift is lace which if your foodie likes to bake there are some very sweet options; lace doilies, lace molds for decorating cakes and maybe even a lace tablecloth. 14th anniversary symbol is ivory which is not really a gift you want to gift anyone, apart from an elephant! So think about an ivory colored new kitchen gadget. 15th anniversary gifts are crystal and although wine is not technically food, I know crazy huh? Crystal wine glasses or a decanter would make a great gift. 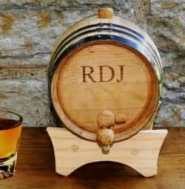 You can even have the glasses engraved with your initials or mine and yours! 20th anniversary is traditionally china and a new dinner service or really gorgeous plates to serve their masterpieces on would also be fitting. You could also choose to go with a Chinese theme and gift a hamper full of Chinese gourmet treats and ingredients, or a new wok or a trip to a Chinese restaurant or your nearest China town. Lots of gift ideas to choose from. 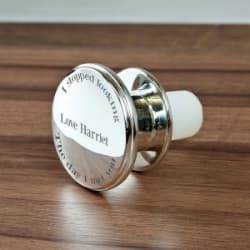 25th anniversary is traditionally silver and you could use this literally as there are lots of stunning silver dining pieces and cutlery that you gift. Many gourmet foods and wines win silver awards each year for taste and overall wonderfulness. Check out the recent winners at the Good Food awards for inspiration. 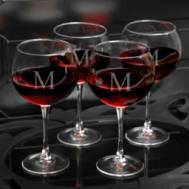 40th anniversary celebrations are symbolised with ruby, which is great for ruby red wine lovers and also those that enjoy a port. 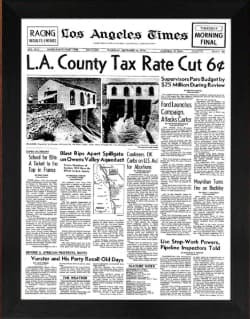 You could have lots of fun with this year’s gift and look at investing in vintage wines, or enjoy a vineyard trip with some sampling too, or a case of their favorite wine. 50th anniversary is gold, for the bakers there is edible gold leaf and glitter for decorating cakes, there are numerous speciality foods that have won gold awards for scrumptiousness and you could also enjoy your next dining experience on gold painted plates. Whatever gourmet treat you choose for your foodie lover you know you will get to enjoy too, so choose wisely and have fun enjoying the experience.